Caitlyn de Beer: Are you a goldfish?? 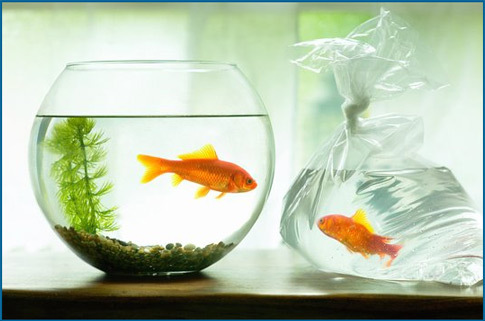 Did you know that goldfish are limited in size by the dimensions of their home (fish bowl)? If you let a goldfish swim in a lake, they'll grow 100 times larger than the usual-size goldfish. In light of this…How many of us are limiting our potential by the size of our comfort zones?? You are BIGGER/contain more potential than you think! Am I dreaming…or have I forgotten how to?? Is the environment I find myself in..challenging me, enriching and making me a better person? Name 1 baby step (a risk, which contains giant but scary potential) you will take this week. Something that requires stepping OUT of your comfort zone towards BIGGER and BETTER things! Let’s take the JUMP together…. out of our fish-bowls. Thank you not only for your encouragement, but for always living up to these principles yourself. It is so inspiring watching you grow in faith & passion as you continually reassess your dreams, desires, your comfort zone & your commitment to living life to the full!